Since opening Purl Soho over ten years ago, we have often dreamed of creating our very own yarn. A yarn that would be as wonderful we could imagine: soft and luxurious, colorful and friendly, warm and beautiful. 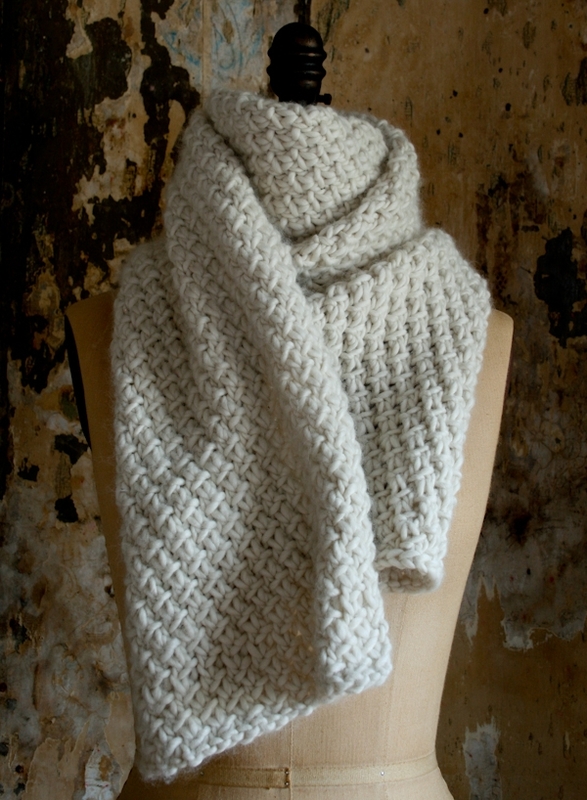 So, I’m thrilled to now be sharing my Snowflake Scarf with you, created with our first ever Purl Soho yarn: Super Soft Merino! 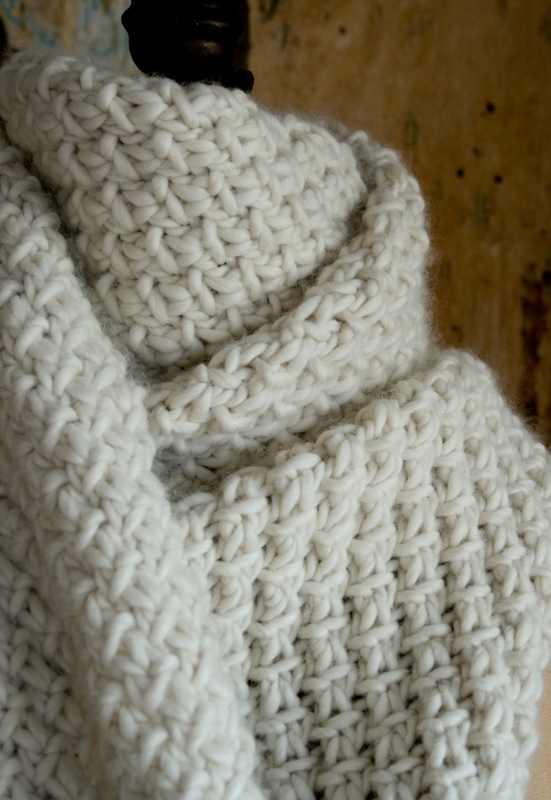 Super Soft Merino makes every lovely detail of the Rosette Stitch glow with a gentle halo of warmth. A chunky single ply of 100% merino wool, this yarn knits up with such a lavish drape and sumptuous coziness that even the most bitter winter wind is a breeze! 4 skeins of Purl Soho’s Super Soft Merino, 100% merino wool. This scarf is made with Heirloom White. Row 2: *P2tog, leaving stitches on left needle, bring yarn to back of work and k2tog through same stitches, drop stitches from left needle, repeat from * to end. Row 4: P1, *p2tog, leaving stitches on left needle, bring yarn to back of work and k2tog through same stitches, drop stitches from left needle, repeat from * until 1 stitch remains, p1. Repeat Rows 1-4 until approximately 30 inches of yarn remains, ending with a wrong side row. Bind off on right side in knit. 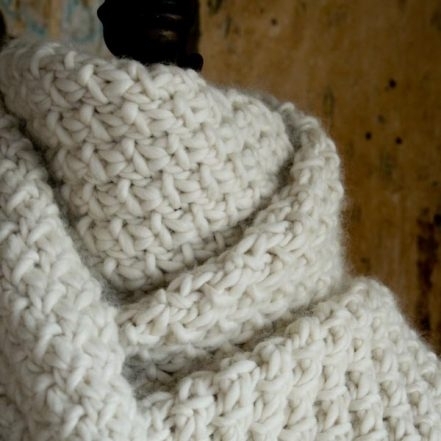 Weave in the ends and wrap yourself up! 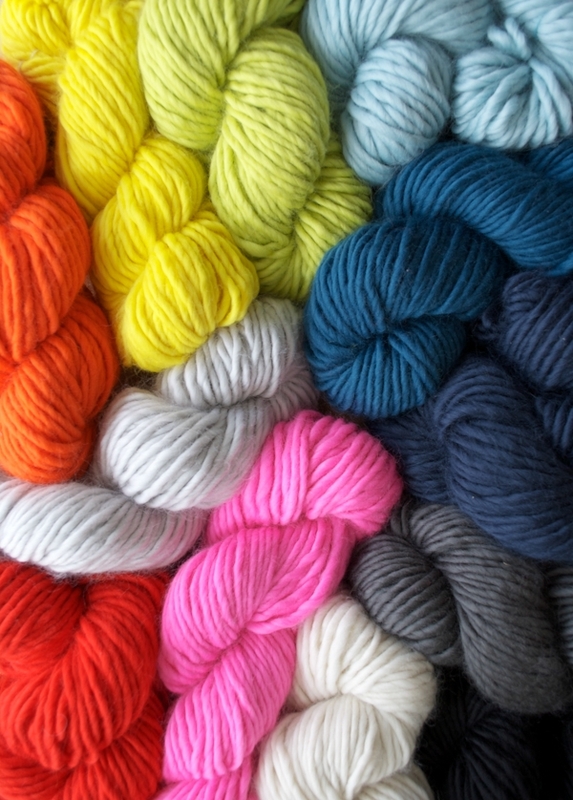 Introducing Purl Soho’s Super Soft Merino! Hi! I’m planning on knitting this beautiful pattern with some bulkier yarn I have laying around – 200g. I saw that the Super Soft Merino is 100g. Would I have to modify the pattern – cast on fewer -16 rows maybe instead of 30? Would it still work and look the same? Thanks for writing in! You can certainly modify this pattern! 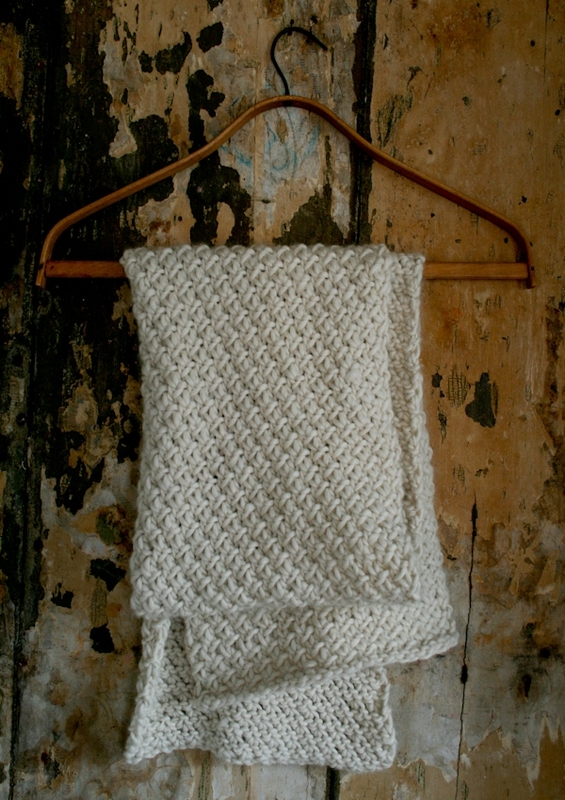 To decide whether you will need to cast on fewer or more stitches, you will need to knit a gauge swatch. 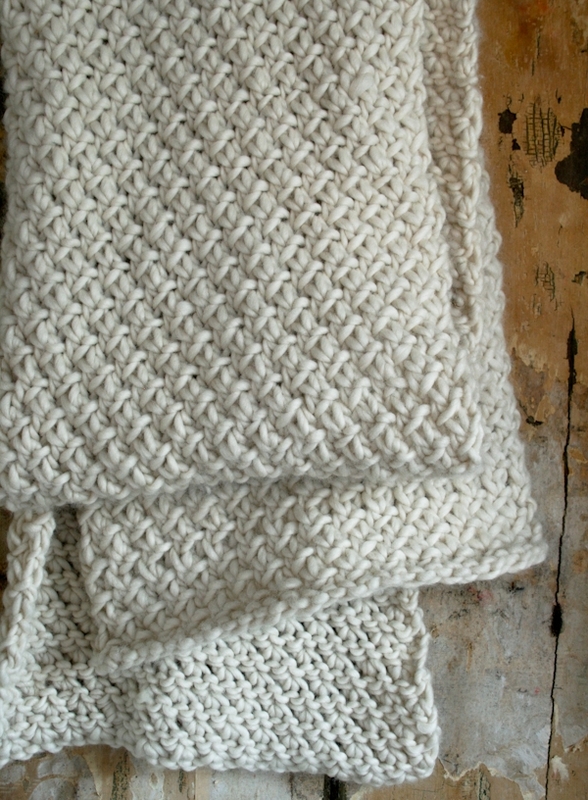 For this pattern the gauge is 3 stitches = 1 inch in stitch pattern. Once you know how many stitches you are getting per inch in pattern, you can multiply that number by 10 inches wide and use the nearest even number as your cast on. For instance, if you are getting 2 stitches per inch in pattern, 2 x 10 = 20, which is an even number so you will cast on 20 stitches! I love this pattern. I made 2 scarfs this winter using Feltro Lanecardate. 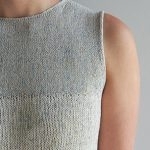 I’m wondering how to rework the pattern for circular knitting? Thank you for writing us- I’m happy to know that you loved making this project! Unfortunately this stitch doesn’t translate to the round very easily so I wouldn’t recommend it for knit in the round projects. Hi, I’m hoping you have a tutorial for this stitch. Thanks for writing in. Unfortunately we don’t have the resources at the moment to do a video tutorial of this. We will keep your request in mind though for the future! 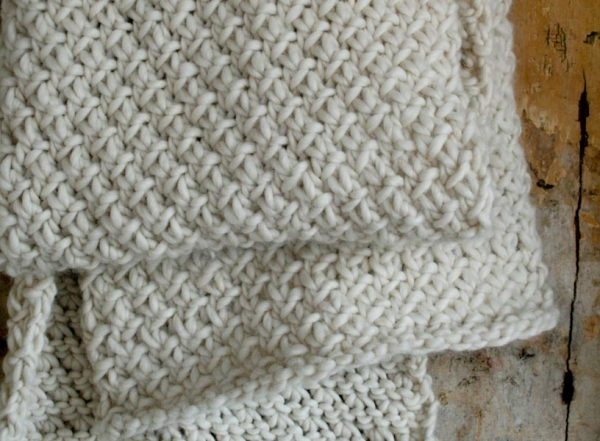 How do you weave in the ends in this stitch? thanks! Thank you for reaching out! To weave in your ends you will want to follow the stitch pattern with your tail. For a more in-depth explanation I would recommend checking out our tutorial!